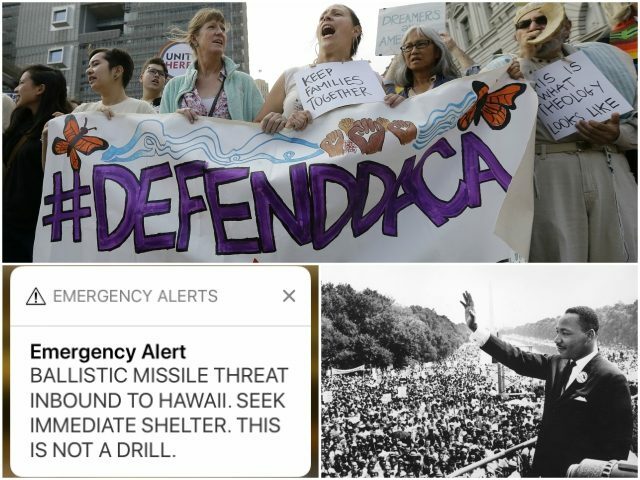 Also on the agenda will be the baffling emergency alert error in Hawaii that sent that state into terror over a non-existent missile attack and a commemoration of the Dr. Martin Luther King Jr. Day holiday. The centerpiece of the show will be a hard-hitting immigration discussion with some of the nation’s top immigration hawks. The author of Arizona’s landmark SB 1070, Kansas Secretary of State and 2018 candidate for governor Kris Kobach, will kick off the program discussing his take on the White House dealmaking that could create an amnesty to replace Barack Obama’s likely-illegal Deferred Action for Childhood Arrivals (DACA). Then, Boyle and House will continue the immigration conversation with one of the Beltway’s leading pro-American immigration researchers Steven Camarota, director of research for the Center for Immigration Studies, and Breitbart News’ Immigration Reporter John Binder. In the second hour, Montana State Auditor Matt Rosendale will join the show to discuss his 2018 campaign for Senate, where he’s taken a tough line on border security. Dr. Alveda King, activist and niece of Dr. Martin Luther King Jr. will also join the show to discuss her uncle’s namesake holiday. In the final hour of the show, actor and producer Nick Loeb will discuss his lawsuit against ex-fiancée, actress Sofia Vergara, for full and sole custody of the former couple’s embryos, and Breitbart News’ National Security Editor Frances Martel will also call in to discuss the Hawaiian ballistic missile mishap and the latest on protests in Iran.